There are several ways to remove a stock from the Table. Please see all options below. To delete a ticker that you have added to the Table through the , you can either uncheck the box to include Quotes tickers in the Table, or you can click the ‘x’ at the end of the ticker name in the Quotes box. To delete all the Quotes tickers , click ‘Clear All’. 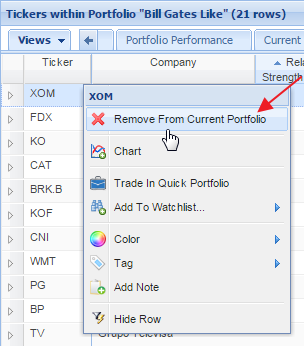 If you’ve loaded a portfolio in the Table, you can remove a stock by right-clicking it and selecting ‘Remove from Current Portfolio’ from the drop-down menu. 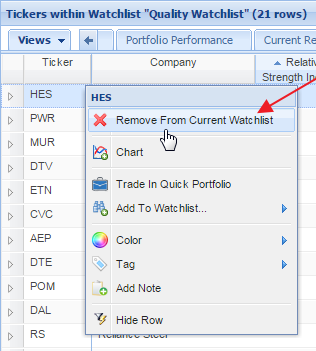 If you’ve loaded a watchlist in the Table, you can remove it by right-clicking it an selecting ‘Remove from Current Watchlist’ from the drop-down menu. 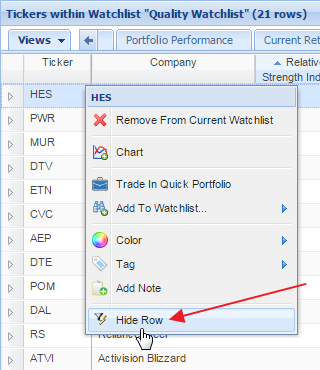 If you’d like to temporarily hide a stock from View, you can do so by right-clicking it and selecting ‘Hide Row’ from the drop-down menu. 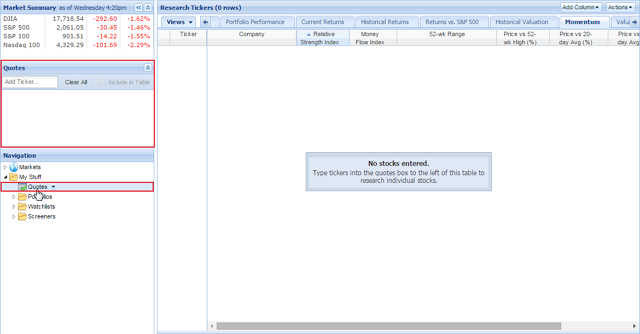 This will apply a filter to the Table on the ‘Ticker’ column, and in order to bring the stock back you must clear this filter by going to the ‘Filter’ menu at the top of the Table, and selecting to clear the Ticker filter. If you’d like to clear the Table so you are only looking at the tickers you’ve typed into the Quotes Box, then click ‘Quotes Box’ in the Navigation panel on the left side of the screen.